A summary and explanation of the Outlast 2 story. For many Outlast 2 players, a simple story explanation and summary can be just the thing you need to truly get a handle on everything going on in the game, and believe me—there’s a lot going on! Even if you’re paying close attention, it’s easy to miss out on the specific clues that help bring all the pieces of the plot together. 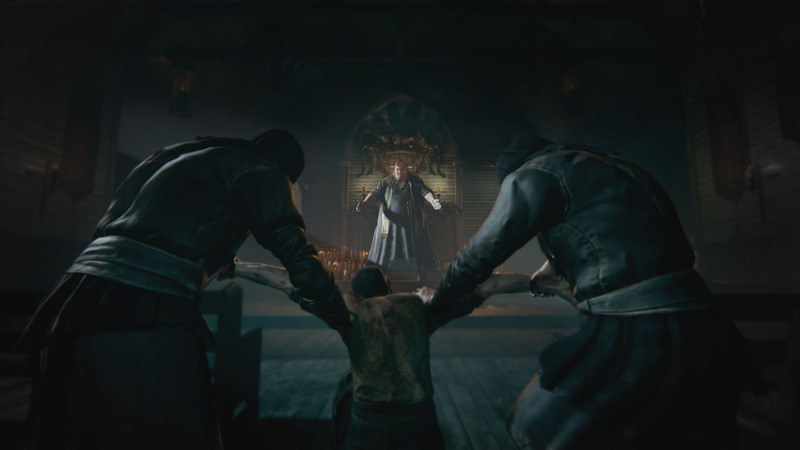 If you’ve played the first Outlast, then you should be familiar with how this series works. The game typically uses a myriad of collectibles such as Recordings and Documents to build up an intricate plot. Over the course of time, that plot slowly unravels into a terrifying story. While there's still many details surrounding Outlast 2's story that remain vague and open for interpretation, we’ll do a quick story overview before moving on to clarify some of the more murky story details. A full summary of the Outlast 2 story. You are Blake Langermann, cameraman, and husband to Lynn Langermann, an investigative journalist who’s looking into the suspicious murder of a pregnant woman in rural Arizona. Your trip starts on a helicopter, where you wake up from a dream. In the dream, you see an old friend you had in the 4th grade by the name of Jessica Gray, who committed suicide. After waking from the dream, you begin to discuss the details with Lynn. There’s a sudden flash of light which causes the helicopter engine to fail and results in a serious crash, separating you from your wife. The search for Lynn begins. In your desperation to find your wife, you run into crazed and homicidal villagers. The flash of light shows up again and causes paralysis among the villagers. You manage to avoid succumbing to the light. You find your wife. She is obviously very traumatized and will not speak about her experiences. You both decide to focus on trying to escape. Prophet Knoth, leader of the religious cult members you keep running into, announces Lynn is pregnant with the antichrist and sends his followers, the Christians, on a mission to find and kill her. You and your wife bump into a Christian search party. Another group called the heretics joins you, but after killing the Christians off, they decide to abduct Lynn, leaving you alone in the woods. You manage to evade the search parties but there is another light flash which prompts you to have a flashback. In the flashback, you’re back in catholic school where your friend Jessica, committed suicide. After you come to, you run into a man named Ethan. He reveals himself to be the father of Anna Lee, the pregnant woman you and your wife were investigating. During his explanation of the story, Ethan summarizes that Prophet Knoth raped Anna, got her pregnant, and then sent Ethan to kill her. Instead, he lied to Knoth, giving her a chance to flee. As stated in the police report, Anna Lee still died from strangulation and had high traces of mercury in her bloodstream. Ethan helps you and allows you to hide in the basement of his home. Ethan is murdered by an old cult member by the name of Marta who is unaware of your presence in the basement. You flee from Ethan’s home, evading more search parties. You find a chapel and encounter a man named Josiah. He’s restrained and missing his eyes. Josiah reveals that he was punished because he refused to tell the cult where Lynn is being kept. You conceal yourself in the confessional, and watches as Knoth tortures Josiah’s spouse, Mary until he finally confesses that Lynn is the mines with the heretics. Knoth kills Josiah and Mary. On your way to the mines, Blake’s visions get darker and more frequent. You encounter Laird and Nick who dub you the Sculled Messiah. They attempt to re-enact the crucifixion and resurrection of Jesus by nailing you to a cross. When you try to escape, you’ll fail and end up getting buried alive. Eventually, you manage to escape and are tasked with evading another religious cult called the Sculled. You stumble upon a boat and make a raft. As you make your descent down the river, your visions continue to worsen. You reach land and continue towards the mines, evading a group of heretics. When you reach the mines, you’ll find an elevator which proves to be faulty. It breaks and plummets into the darkness. You survive the fall, and deep inside the mines, you encounter Val and her group of heretics from earlier. They don’t want to give up Lynn and attempt to kill you. You manage to escape Val but mistakenly end up in the middle of a heretic gathering where you find Lynn. Val finds you and you have another vision. This time revealing an important piece to the plot. In his vision, you see what happened to Jessica before she committed suicide. When you awaken, you find yourself still in the mines. You’re chased by some heretics until you find the exit. You also encounter Lynn. Together you flee from the mines. You’ll run through the woods as a storm rages on. Marta shows up and tries to kill the both of you. Before she can, the cross from the top of the church falls down and kills her. Inside the chapel, Lynn dies giving birth. Blake passes out with the baby in his arms. When you awake, Knoth is sitting next to you. He starts rambling on about killing all of the Christians and then instructs you to kill the baby. He then commits suicide by slitting his throat. Blake walks down to the square with the baby. It appears that everyone is dead. You have one last vision. A girl that looks like Jessica is in the Catholic school kitchen with bruising around her neck. After she says a prayer, the game comes to a finish. The "Old Traveler" Document that links Outlast to Outlast 2's story. As the story in Outlast 2 progresses, you’ll notice that Blake slowly starts to lose his mind. His visions of Catholic school and the events surrounding the death of Jessica Gray begin to consume him because of the residual guilt and a feeling of being personally responsible for her suicide. In Blake's vision, it's revealed that he and Jessica had a somewhat romantic relationship. Blake expresses feelings for Lynn to Jessica. They get caught hanging around late at school by Father Loutermilch who tells Blake to go home. Jessica asks Blake not to leave and shows concern for being alone with Loutermilch. Despite her pleas, Blake leaves and can hear Jessica screaming. She's violently assaulted by Loutermilch and Jessica is devastated that Blake would abandon her when she needed him the most. She later commits suicide by hanging herself. In your visions, the demonic entity you see is Father Loutermilch. This is revealed by the mark above the phantom’s right eye, which is in the exact same spot as the scar on Father Loutermilch’s face. During your playthrough, you’ll find a Document called Old Traveler sticking out of a sleeping bag by the lake. The entry goes into detail about the source of the light you see repeatedly throughout the game. This light is a signal emitted from a nearby radio tower and is used for brainwashing/mind control. See our guide to all the document and recording locations in Outlast 2 for where to find these collectibles. In the same Document, Jenny Roland, also known as Jennifer Roland, the pathologist from Mount Massive Asylum, is mentioned. This reveals that the device is made by the Murkoff Corporation, the very same company behind the MKULTRA program that ravaged Mount Massive Asylum. Eventually, the prolonged exposure to the signal drives everyone in the village violently insane causing them to turn on one another and kill each other. As for the ending to Outlast 2, we can only speculate about what happened to Blake and the baby. We would love to hear some of your theories in the comments below. If you'd like a more thorough explanation of the game and story, be sure to check out our feature on the horror inspirations behind Outlast 2, and our complete Outlast 2 walkthrough.